Various technologies can be used for installing horizontal wells for subsurface pollution control. Such wells are typically installed in unconsolidated soils 10-200 feet deep. Selection of drilling technique depends on surface access, well placement and completion requirements, and subsurface hydrogeology. Jetting and moling are the most common techniques used to create horizontal borings in shallow, unconsolidated soils. Both are mechanically simple and require minimal labor, using small tubulars that can be handled by one person. Small trucks can carry the hardware for both techniques. Moling employs a rotating bit, compressing soil into the hole wall. This requires a soft, compressible soil. Directional control is limited and relies chiefly on trial-and-error targeting methods. Holes are only a few inches in diameter, limiting completion options. No drilling fluid is used, and no cuttings are generated. Clayey soils may become "damaged" (i.e., their permeability may be reduced) because the cuttings are not removed from moling boreholes. Jetting employs an off-axis, high-pressure water jet to fluidize the formation. Downhole transmitters and a walk-over receiver are used for surveying the well location and determining jet orientation. The operator can steer the system accurately in unconsolidated, homogeneous soils. Jetting requires that there be no interference sources between the surface receiver and downhole transmitter.The transmitter must not be located deeper than 25 ft below the surface. Drilling fluid lubricates the drill string. Cuttings mixed with drilling fluid enter the soil formation along the wellbore, which may cause formation damage as with moling. Positive displacement steerable motor technology offers vertical and horizontal directional control. The radius of curvature is small compared to that of rotary drilling, because the drill-string rotation is minimal. Penetration rates are high because of rapid bit rotation. Drilling fluid forms an impermeable layer on the borehole wall, preventing fluid and cuttings from entering the formation, as with rotary drilling. The impermeable layer also prevents hole collapse by maintaining positive fluid pressure within the wellbore. The impermeable layer must be removed following installation of the screened casing, to expose undamaged formation. Drilling fluid must remove cuttings from the wellbore. Viscosity and turbulence of the drilling fluid allow it to clear the wellbore. By comparison, vertical wellbores rely solely on viscosity. Turbulence prevents cuttings from accumulating along the bottom of the wellbore. Since turbulence increases with decreasing viscosity, ideal drilling fluid balances both factors. Thixotropic gels are well suited as drilling fluids. Turbulence is also maintained with the help of centralizes, which provide a uniform annulus around the tubulars . 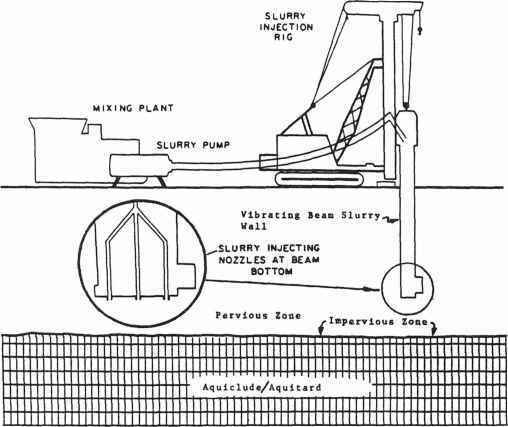 Percussion and vibration drilling techniques use air as a drilling fluid. These techniques are particularly suitable for drilling through heterogeneous soils containing boulders or coarse gravel or through highly fractured rock formations. The wellbore remains dry, so fluid loss is avoided. However, percussion and vibration drilling techniques currently lack well-developed steerability and directional control.